Posted on October 02, 2016. Is your home looking a little drab? You can make some easy home improvements that will not drain your bank account. 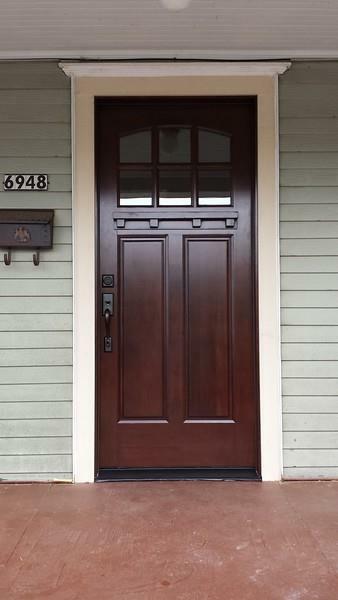 Getting new exterior front doors in Portland, OR, may be enough to add extra character to an out-of-date exterior. If your front door is in good condition, however, you may be better served by a Portland, Oregon, window replacement. The Material: Many new doors come in wood, fiberglass or vinyl. You may even be able to find a product with reinforced deadbolts and door jambs. The Energy Efficiency: The great thing about new door manufacturing technology is the products are much more energy efficient than their older counterparts. The Color: Depending on the door, you may be able to pick a customized color that will perfectly complement the other exterior elements of your house. The Design: Some entry doors even come with design features, such as inlays and windows. With a fairly simple installation, you can change the appeal of your home and the function of your entryway. Replacement windows can also add functionality and looks to a home. Putting in new windows is a great way to increase the energy efficiency of your home. This can be an important characteristic during the winter months in this area. Whether you are installing exterior front doors in Portland, OR, or getting new windows, you may want to work with professionals. This team will be able to help you choose a product that best fits your needs. The contractor may also be able to ensure the products are installed correctly.